Item Name Queen High Gloss Bed with Drawers and Panel with Lights - PROMO! Item Size W 62" x D 83" x H 41"
Queen High Gloss Bed with Drawers and Panel with Lights - PROMO! Perfect solution for any condo space. Available in high gloss black or white color. Extra for night tables. Delivery and installation not included for PROMO product. This is a limited offer - until quantity left! Modern High Gloss Night Table - PROMO! Modern High Gloss Tall Chest - PROMO! Modern High Gloss Mirror - PROMO! Modern 4 Drawer High Gloss Dresser - PROMO! 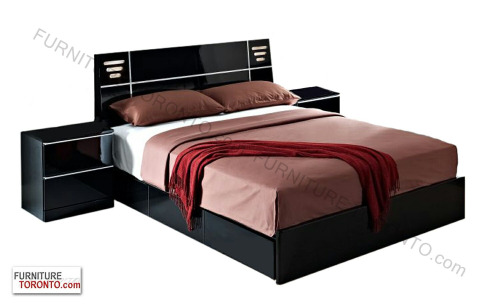 Double High Gloss Bed with Drawers and Panel with Lights - PROMO!